'Tis the Season! The season of family and love and visiting. And sometimes that means having a cozy spot for friends and family to stay. If this is the case you want them to feel as welcomed and cozy as if they were in their own bed. How do you do that? I’m so glad you asked. Here are some great guest room tips for making overnight guests feel welcome. Yay! The guests have arrived! At the very least, they’ll want a place to dump their stuff. Let them know if there’s a special spot to store their suitcases or offer to store them yourself. This’ll go a long way towards making them feel more settled. Obviously, this is uber important when it comes to overnight guests. It’s safe to say we’re all past our couch surfing days. Make your guest feel welcome with their own bed or even a pull-out. I’ve got a day bed that pulls out into a king sized bed. It takes up nearly no room when there are no guests and doubles as a sofa. A nice, fresh set of sheets with no holes or mystery stains is a must. Keep them separate from the everyday linens if you have to. Cozy throws or blankets if it gets chilly. It’s better to have access to all these things than to spend a night miserable as a result of not having them. psst! free bedding 101 guide here! I don’t know about you, but with the TSA rules and just general mama-brain, I often forget key hygiene items when I travel! For just this occasion, have a stash of bathroom necessities ready for them to use as needed. Include a toothbrush, toothpaste, razor, shampoo and conditioner.... think about what makes you feel luxurious at a hotel. And maybe grab some freebies the next time you travel with this in mind! Several sets of towels, washcloths, hand towels are needed as well. Bonus: super simple upkeep with just bleach! Want extra brownie points? Keep a fluffy robe and slippers nearby, too! If your pantry is anything like mine, you have a fine array of cheerios, cheese sticks, juice boxes and Pirate Booty to choose from. And, while this is snacking heaven for children, adults don't get that same tingly feeling about them. With this in mind, make a special treat basket/box/what-have-you with some adult snacks for your guest. You don’t want to worry about refrigeration, so try fresh fruit like a banana or orange, crackers, cereal bars, nuts…these are all great. And don’t forget the water! Put a bottle or more of water and a glass for washing it all down. Put aside some magazines you think they may like. Or, if you know them well enough, a book you thought they’d particularly enjoy. 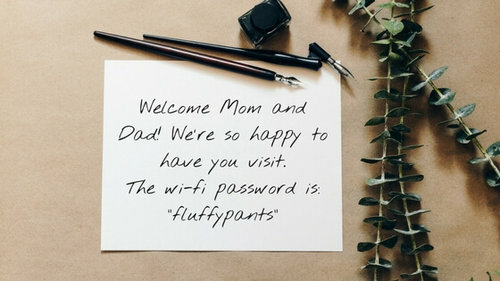 No matter what, write down the Wi-Fi password! I like to buy a 3”x5” frame and frame the password in a cute script. It’s easier to find and looks fancy on their nightstand. Let them know what’s special about your home area! Or perhaps a book on the history of your town if your visitors are history buffs. There you have it! Your guide to creating a guest room visitors will return to again and again. And they’ll be so grateful to have a cozy room of their own (and see your little ones, of course!) they’ll insist you have an evening out. Wins all around! If you found this helpful, you’ll want to grab the other parts of the Thanksgiving Survival Guide I’ve got to share. More on getting your living room ready for company, how to get your kiddos to actually sit, eat and enjoy Thanksgiving dinner and other goodies. Get the info. Read up. Meet the holiday season head on with reasonable expectations for your kids and your home. 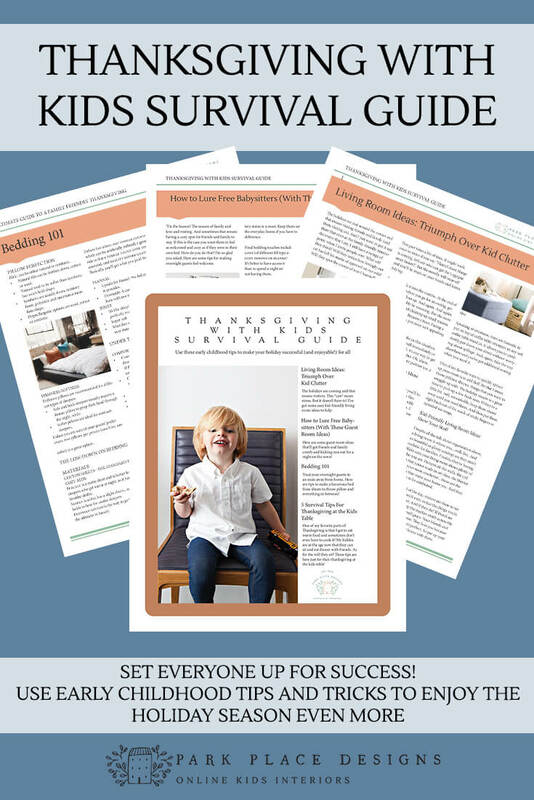 FREE THANKSGIVING WITH KIDS SURVIVAL GUIDE! Fantastic! I know you’ll love these tips and that they’ll really save you some time and much needed energy this holiday season. Enjoy! Even with kids! *This will sign you up to get more emails from me, but if that’s not cool with you, let me know and I’ll take you off right away. Fantastic! Here’s the guide that will make your Thanksgiving one to remember and enjoy!